Last night 12 people were at my house for dinner, including a friend who is Muslim so no pork. I created this dish in order to feed both my Muslim and vegetarian friends. You could use regular chorizo, but after trying soyrizo, I quit using anything else and even my Mexican friends love it. Tastes the same, but not so greasy so probably healthier. Cover the bottom of the casserole with olive oil. Layer the sliced potatoes so that they totally cover the bottom of the dish. Remove the soy chorizo from its casing and crumble it over the potatoes. Layer the sliced poblanos over the chorizo. Sprinkle the chopped onions over the top of the peppers. Scatter the cherry tomatoes on top of the onions. In a blender, combine the half and half, the flour, and the chili powder. Pour evenly over the casserole. Cover with aluminum foil and bake at 350 degrees until the potatoes are tender. You may uncover the casserole and continue baking for the last ten to fifteen minutes if you would like the top a bit browned. Cover the bottom of a heavy casserole with olive oil. Place thinly sliced potatoes–I used purple ones–to cover the bottom of the pan. Continue layering your choice of vegetables, spices, and olive oil. Bake at 400 degrees until the potatoes on done, stirring occasionally. About ten minutes before the casserole is done, add kale leaves. The potatoes take longer to cook than any other vegetables I have ever used. Last night I used these vegetables: purple potatoes, yams, baby carrots, brussel sprouts, chopped onions, beets, kale, red jalapeños (seeded and halved), and whole garlic cloves. This is also good with garbanzo beans added just before the kale. I was going to take photos but was too busy entertaining to take them. The Vegetables casserole is the best !!! Raised on a family farm in Northwestern Missouri, I became a singer, college administrator, corporate manager, educator, and author. My first poem was published in a statewide anthology when I was in high school. I am a former member of the Board for the Story Circle Network, a group of women dedicated to women telling their stories. I have a Ph.D from The Ohio State University and a B.A. and M.A. from the University of Rhode Island. Currently, I teach high school English and Spanish, sing, write and raise horses in the Panhandle of Texas. 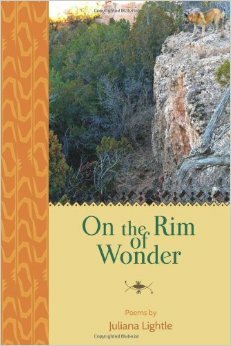 My latest book, On the Rim of Wonder, was published in April 2014 by Uno Mundo Press. Food is the best expression of every emotion. Explore through my reviews, recipes, events and more. STIR explores the gray areas of controversy. Join us. Combining atheism with whimsy. This is a Fair and Balanced blog based on opinion unencumbered by fact.